Millstone Mayhem is the tenth level in Donkey Kong Country. It is also the fifth and final non-boss level in the Monkey Mines area. 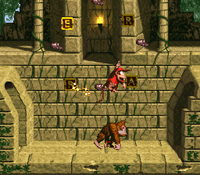 Taking place in the first temple level of the game, Donkey Kong and Diddy Kong face a new obstacle here. Throughout the whole level, invincible Gnawties piloting Millstones block them. These foes patrol certain areas, forcing the Kongs to dodge them. Another strong enemy first faced here is the mighty Krusha, who cannot be defeated with a front attack or a normal jump from Diddy alone. Other enemies here include blue Kritters, along with Slippas and some Neckies. To make the level a bit easier, the helpful Animal Friend, Winky the Frog resides here to give the Kongs a ride through the last half of the level. However, he is hidden in a high area in the level. The characters dash under a Millstone. 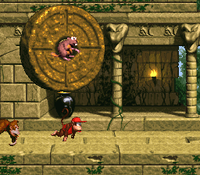 The Kongs begin the level by exiting a large tunnel and approaching a slanted wall with a tire in front of it. They can use the item to reach the top of the wall and then head down a pathway with several long, stair-like structures that a few Krushas walk along. Two TNT Barrels sit at the beginning of the pathway. A DK Barrel also wobbles next to a small ledge with a millstone being piloted by a Gnawty on it. The millstone moves up and down, so the heroes can dash under it as it moves over their heads. After passing a thin abyss with a Barrel Cannon in it, the primates approach a Kritter and a millstone that they must run under. The letter O floats ahead of here near a small ledge with several Kritters to the right of it. A millstone moves on top of a large alcove nearby that the primates must run through to pass under the obstacle. The Kongs can find another millstone proceeding in a vertical path above another alcove containing a TNT Barrel ahead of here. A few Krushas march down the stair-like structures ahead of here, which is followed by another small alcove with a millstone rolling from left to right above it. 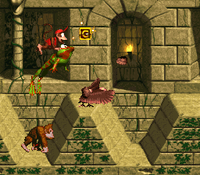 Once the primates sneak through the alcove and pass the Gnawty-controlled obstacle, they approach a broad alcove consisting of several jumping Kritters. A DK Barrel wobbles ahead of the gap with two small abyss after it. The level's Star Barrel hovers over the carved, stone platform between the two pits. Donkey Kong finds Winky the Animal Friend. After crossing the abyss following this barrel, the heroes access a long pathway holding a TNT Barrel, a Slippa, and another millstone that moves back and forth in a vertical path. Once they pass under it, they reach another abyss that they can cross to reach a large structure containing many small, stair-like structures covered in a few Slippas. A piece of the ground is here that they can break to reveal a tire that is useful in reaching a high platform nearby. It leads to a high part of the temple, located after an abyss with a millstone moving above it. An Animal Crate containing Winky can be found here. If the primates are not in possession of the tire when they come up to the abyss, they can ride on a moving platform to reach an area with an alcove full of Slippas in it. The letter N and an abyss can be found after the alcove. After the duo crosses the pit, they approach a millstone moving over a ledge with another DK Barrel near it. A Necky stands on a statue ahead of here, throwing nuts at the group. The heroes can find two small alcoves ahead of the bird enemy, and both of them contain Slippas. 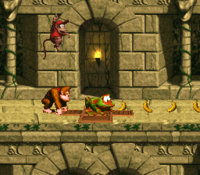 A millstone rolls back and forth over the gaps, but once it is passed, the Kongs can safely progress to another abyss and then to an additional pair of small alcoves with an egg-throwing Necky between them. The letter G hovers over the foe's head. The primates can find another millstone ahead, which travels over a large abyss with several Slippas within it. They come to another millstone above a pit after running down several stair-like structures. A sign indicating that the level is near complete stands at the other side of the abyss on top of a small ledge. 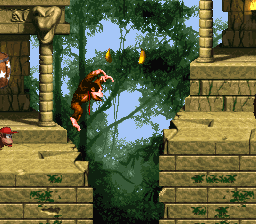 After jumping over a millstone with the use of a tire sticking out of the ground, the primates approach an abyss containing two Banana Bunches that float above a Zinger. An exit sign follows a few stair-like structures nearby, and once the heroes enter the tunnel ahead of it, they finish the level. Diddy Kong and Winky jump to the letter "G" above a Necky. K: The letter K is in the first Bonus Level, where the primates must shoot into the first row to the right to reach it. O: The heroes come up to the letter O near a ledge after passing under the second millstone. N: The letter N can be discovered immediately before an abyss found near the third DK Barrel in the level. G: The letter G hovers above the only egg-throwing Necky in the level. At the beginning of the level, the Kongs can discover a tire. They must bounce left in mid-air to land on top of the entrance, where a barrel can be found. It takes the Kongs to a Bonus Level, where they must ride back and fourth in a barrel. As it moves, they can collect three rows of bananas. The Kongs must grab bananas as they blast upwards, gaining a prize at the top of the rows. If the Kongs miss the barrel upon trying to land, they end up back in the main level. After the Kongs pass the first Gnawty on a millstone, they can see a barrel hidden in a nearby pit. They must jump in it and shoot upwards. If they land on a cracked area on the ground, a tire appears. The Kongs must push it past the letter O and then stop when they see a Gnawty. From there, they must bounce off of the tire and land in a barrel above a Gnawty and its millstone. It shoots them into a Bonus Level, where they must hit some rotating letters in the correct order to spell out the word, "Rare." Once this is done, they are awarded with an Animal Token and then exit the bonus. If they fail to spell out the word correctly, they are forced back into the main level without a prize. In the middle of the level, the Kongs can find a Gnawty over a small alcove. They must carry a TNT Barrel into the alcove and destroy the fragile wall with the TNT Barrel to find the entrance to a Bonus Level. In this Bonus Level, the Kongs must watch as a green Extra Life Balloon moves around quickly in four barrels. Once it stops, they must choose the barrel it is located in. If they chose correctly, they are awarded with the balloon and then leave the bonus. They are given no prize if they fail to choose the correct barrel. When the Kongs reach the small pit shortly after the first millstone, they should jump into it to land in a Barrel Cannon that blasts them upwards. They should land on a distinguished piece of the ground to release a tire from it. If they push the tire back to the beginning of the level before the first ledge, they should be able to bounce high in the air on it and reach a Warp Barrel that takes them to a sign near the end of the level. This warp only appears in the Super Nintendo Entertainment System version of the game. At the beginning of the level, past the first millstone, there is a small pit with a Barrel Cannon in it. The Kongs must jump into the barrel and then go left, leading them into a Warp Barrel. This warp only appears in the Game Boy Advance version of the game. Donkey Kong bounces on a tire at the beginning of the level. Donkey Kong prepares to throw a TNT Barrel at a millstone. The Kongs look down into an abyss containing two Banana Bunches and a Zinger. ↑ @Ghoulyboy (11:09, September 12, 2015). Last bunch of #DKCrevealed levels before I move onto some unused stuff. It's a Barrels, Ice and Temple combo. Twitter. Retrieved July 23, 2018. This page was last edited on April 5, 2019, at 12:23.